he 2016 inductees for the Maine Sports Hall of Fame gather for a group photo prior to Sunday's awards banquet at the Cross Insurance Center in Bangor. Pictured are: (front row, from left): Kristin Barry, Sheri Piers, John "Jack" Kelley, Travis Roy, Ralph Payne, Pennie Page Cummings and Ed Phillips. In the back row are: Royce Cross, Woodrow Cross II, Jonathan Cross, Kirsten Clark-Rickenbach, Dan Hamblet, Doug Friedman and Amy Vachon. BANGOR, Maine — Ralph Payne is regarded as the best running back ever to play for Brewer High School and among the best in Maine history. On Sunday, at his enshrinement into the Maine Sports Hall of Fame, all he could talk about those with whom he shared success on the Witches’ powerhouse teams from 1968-1970. “More than anything else, this day was made possible by the great Ken Perrone,” Payne said of the legendary Brewer coach, who was unable to attend the ceremonies at the Cross Insurance Center because of complications from a recent knee replacement surgery. 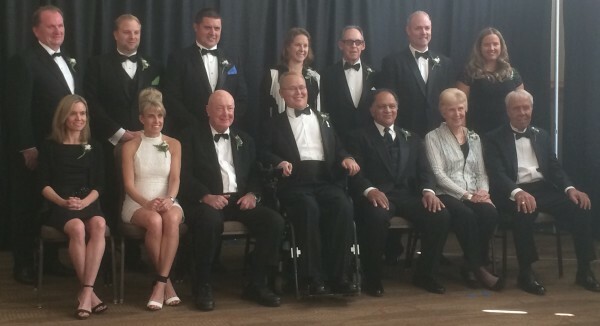 Payne was among 12 inductees enshrined at the annual ceremony. Also honored were former hockey players Travis Roy and Doug Friedman, former basketball star Amy Vachon, distance runners Kristin Barry and Sheri Piers, longtime college hockey coach Jack Kelley, former big-league pitcher Ed Phillips, powerlifter Dan Hamblet, golfer Pennie Page Cummings, skier Kirsten Clark-Rickenbach and the Cross family, which runs Cross Insurance. Approximately 700 people turned out to celebrate the noteworthy careers of those individuals, all of whom have impacted sports in Maine. Payne, an Orrington native, scored 45 touchdowns in three seasons as Brewer went 30-2 from 1968-1970. As a senior, the Witches were ranked No. 5 in the country. That season, Payne rushed for 1,239 yards and 17 TDs in 1970 and gained All-America recognition. Payne shared his award with many former teammates, schoolmates and friends. Roy was a highly-regarded hockey player from Yarmouth who played for Casco Bay youth hockey and at Tabor Academy in Massachusetts before earning a scholarship from Boston University. “I had kind of gone under the radar for a lot of my career, but I was really looking forward to making a statement at BU and seeing what would come after that,” said Roy, who was inspired by Yarmouth’s Eric Weinrich (an NHL player) and through his interactions as a stick boy for the American Hockey League’s Portland Pirates. On Sunday, he wore a Calder Cup championship ring given to him by then-Pirates owner Ed Anderson. Roy’s life was forever altered on the first shift of his first game at BU in 1995. He crashed head-first into the boards trying to check a North Dakota player and was paralyzed from the neck down. He had made a lasting impact since his accident. In 1997, he and his family started the Travis Roy Foundation, which has recently almost raised $1 million per year. It seeks to enhances the lives of people with spinal cord injuries by providing them with adaptive equipment and supporting medical research. Roy is an inspirational speaker, giving 40-50 talks annually at corporate events, colleges and schools around the country. “All those little sayings of never giving up, having a positive attitude, setting goals … I put them to use before my injury and I’ve put them to use since,” Roy said. “It was a lot more fun having a passion to play hockey, but the last 20 years I’ve found a purpose in trying to give back with the Travis Roy Foundation,” he added. Vachon was a basketball star at Cony High School of Augusta and at the University of Maine. At Cony, playing for her father, Paul Vachon, the Rams posted a four-year record of 82-5 with two Class A state titles. Vachon, who amassed 1,418 points, 977 assists and 524 steals in her career, was a four-time BDN All-Maine selection. At UMaine, the point guard directed a team that made four straight trips to the NCAA tournament and earned the program’s only tourney win in 1999. “It’s humbling and very exciting to be here and to be honored with all the other inductees, Vachon said. “I had so many positive adults in my life, coaches and teachers, and obviously my parents and my family,” she added. Vachon is UMaine’s career assists leader with 759, which ranks 22nd in NCAA history. Vachon, in her fifth season at UMaine, learned Sunday that she has been promoted to associate head coach. She previously was an assistant coach at Catherine McAuley, Greely, Cony and Waterville high schools. The Maine Sports Hall also honored the Lewiston High School boys soccer team for its teamwork, leadership and excellence. Coach Mike McGraw’s tea, which had players from the U.S., Germany, Somalia, Congo, Turkey and Kenya, was ranked in the top 25 of USA Today/National Soccer Coaches Association of America poll. The team won the Class A state title last fall after finishing 18-0 and outscoring its opponents 114-7. — Kelley, a U.S. Hockey Hall of Famer who coached the Colby College men’s hockey team, guided Boston University to two national titles and was president of the Pittsburgh Penguins. — Barry, of South Portland, and Piers, of Westbrook, qualified for the Olympic Marathon trials in 2008. The friends, who train together, have placed in the upper tier of the Boston Marathon and the Beach to Beacon 10K. — Raymond native Clark-Rickenbach was a downhiller on the U.S. Ski Team and competed in three Winter Olympics. She won seven U.S. titles, and had 30 top-10 World Cup finishes. — Cummings, of Lewiston, won the Maine Women’s Amateur Championship six times in four decades and finished as runner-up nine times. She also has claimed 11 Senior Championships in the last 20 years. — Friedman, of Cape Elizabeth, enjoyed a nine-year pro hockey career. He won a Calder Cup with the AHL’s Hershey Bears and played with Edmonton and Nashville in the NHL. The former Boston University captain is the ice hockey coach and director of athletics at Kents Hill School. — Hamblett, of Portland, won 28 state powerlifting championships, 19 national titles and five world crowns while setting three American records and one world standard. — Phillips, of Portland, pitched for the Red Sox in 1970 and had a stellar minor-league career. He was the No. 1 hurler for Colby College, and an All-State player at Deering High. — The Cross family has advanced sport in Maine through its naming rights at the Cross Insurance Center and Cross Insurance Arena in Portland. It features the Cross Insurance Pavilion & Business Center at Gillette Stadium, home of the New England Patriots, and has a presence with the Red Sox, Celtics and Bruins. The Hall of Fame also honored its five senior Scholar Athletes, each of whom received a $5,000 scholarship for outstanding achievements in athletics and in the classroom. The winners were Talor Hamilton of Ellsworth, Walter Conrad of Yarmouth, Madeline Hasson of South Portland, Anna Lastra of Fryeburg Academy and Riley Robinson of Dirigo in Dixfield.